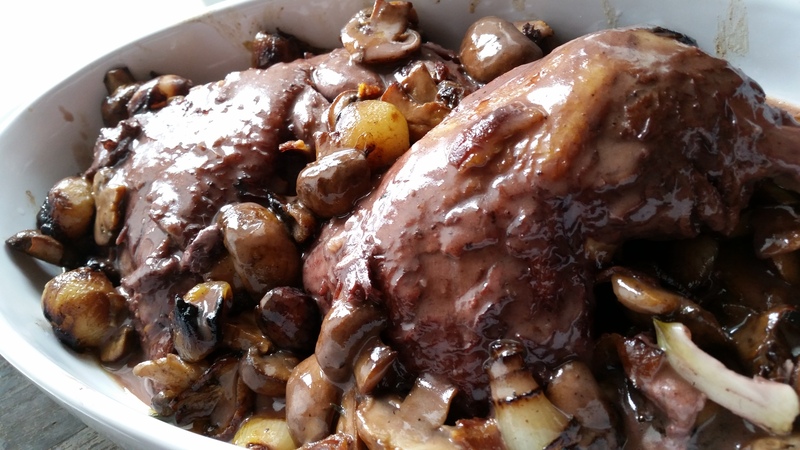 As I’ve been spot checking the site to see what needs to be updated, I was going over my About page and remembered that I wanted to learn how to make coq au vin. 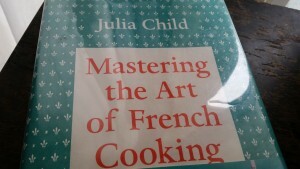 What better way to learn but to learn from the master herself, Julia Child. Before we begin, I’m going to say this…this was the first time, as well as the last time I will ever make coq au vin. While it was challenging and interesting, it was also very time consuming. Since it was Easter Sunday when I made this, I also had to make up a few other things before the main course could be served. I had never made Baked Camembert before. I have to say that it was extremely simple to make and came out like a piece of artwork. 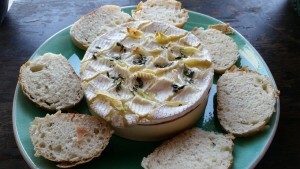 I used the Thyme and Garlic Baked Camembert recipe from What’s Gaby Cooking. The only thing I did differently was use truffle oil instead of olive oil. This easy starter recipe was so good and absolutely hassle free to make, I almost ate the whole thing on my own, forgetting that Easter Sunday was just beginning. I highly recommend making this. As an additional side dish, I also made Honey Hen wings. I adapted it from Laura Calder’s recipe and used wings instead of chicken quarters. It was so delicious the first time I made it (last week), it was well worth making it for the second time in a row. 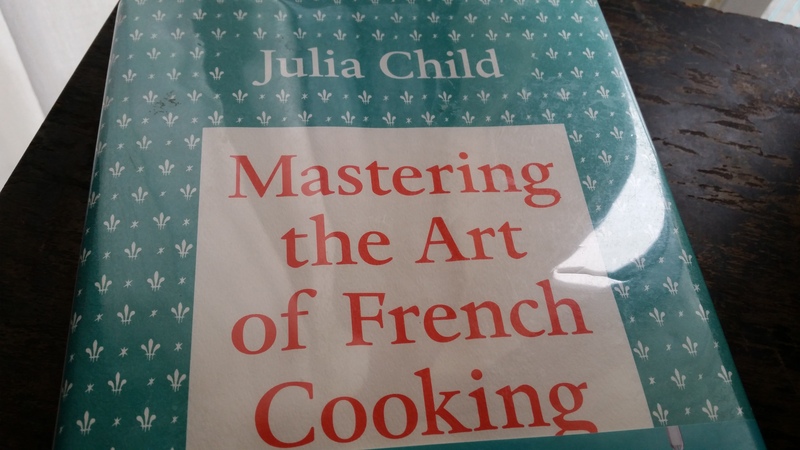 Since this recipe is rather lengthy, as well as the process, Life’s a Feast made this same recipe and posted up the original Julia Child recipe, including what she had for dessert: Charlotte au Chocolat. The coq au vin recipe isn’t just for the chicken. Her post also includes the additional two recipes: Champignons Sautés au Beurre (Sautéed Mushrooms) and Oignons Glacés à Brun (Brown-Braised Onions). In order to make this dish, you have to make the mushrooms and the onions on the side. Braising the onions alone takes around 45 minutes to do. For the alcohol content, I used cognac (which was a really cool process…I’d never flambé before) and chianti as the wine. It took about 3 hours to make this dish from start to finish. Was it worth the wait? No. It wasn’t. The meal was delicious, but by the time everything was complete, I was so exhausted, I couldn’t enjoy the fruits of my labor. For sides, I made a plate of simple peas and Fingerling Potatoes Braised with Smoked Paprika from Fat Free Vegan Kitchen. While the chicken was simmering over the flames, I put together this rather simple pear flan recipe from Julia Child (as found on Bettunya’s blog). I tried to use up as much cognac as I could on Sunday, so I decided to use cognac to soak the pears in. You’re only supposed to soak the pears for an hour in the alcohol. Because I was taking so long with the coq au vin, the pears ended up soaking for 2 hours. Trust me, this ended up being a good thing. 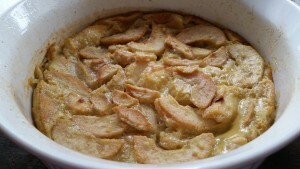 By the time the main entree was on the plates, the clafouti was ready to come out of the oven to cool. The cognac made the dish smell so good! After dinner, the clafouti was passed around, topped with some ice cream and when I say this was the treat of the day…oh believe me, it was a treat! I felt so drunk after eating half a slice. Like I said, the pears soaked in cognac for 2 hours was a good thing. I usually do not make French desserts, so I was happy with how easy this was to put together. Julia’s original recipe called for Bing Cherries, but it can be substituted with apples, pears, etc. This is a dish you will definitely enjoy. It is a must try!